Shared facilities in Berber villages are rare. Beyond the Mosque—a community of 14 men has an obligation to build a Mosque—few traditional berber villages own much in common. It is this lack of formal community structure that makes the village structure so viable. No one speaks on behalf of another. This lack of local organisation meant it took nearly 2 years to form a Village Association to receive the fee negotiated with Martin Scorsese for the use of the village and the Kasbah for his film Kundun. It was this association that started community rubbish clearance. As these initiatives developed it became clear that there were a growing number of associations (NGOs) having very narrow objectives and different management. 1999 saw the formation of an ‘umbrella’ association of all the villages in the Imlil valley, which has given the region more credibility, and ‘clout’ with the local administration. “The Association of the Valleys of Imlil”, as it has been named, contains representatives of most the individual village associations. This has been done to provide more niformity and direction for projects and proposals in the region. The Association members insisted that Mike McHugo (Discover’s Managing Director) also be on the committee despite his objections (he gets embarrassed)! The Association’s aim is to co-ordinate development and projects in the region on a purely apolitical basis. It was quickly agreed that the first project would be to provide an ambulance and driver for the region. Lack of dedicated transport to Asni and Marrakech has resulted in a number of deaths over the years, many of which had been death during childbirth. It was hoped that the ambulance would go some way to reducing that number. The Association approached Discover, who agreed to underwrite, in the first instance, the purchase of a vehicle from England. The ambulance arrived in Imlil in December 1999. The original ambulance is now in a more remote village and Imlil has a brand new ambulance donated by a French Charity – Coeur du Monde who recognised that the Association des Bassins d’Imlil is a robust organisation and can trusted to deliver value. This has been a major achievement for the Association and should encourage them and the villages involved to go on to tackle further projects. Several schools have shown a great deal of interest in supporting the Association in its work: Christ’s Hospital, Pontelands, Bristol Grammar, Millais to name a few they have made generous donations to the Association and will be maintaining permanent links with it. We would like to thank the staff and pupils at these schools who have been involved in fund-raising and hope that the links established grow and flourish over the years to come. 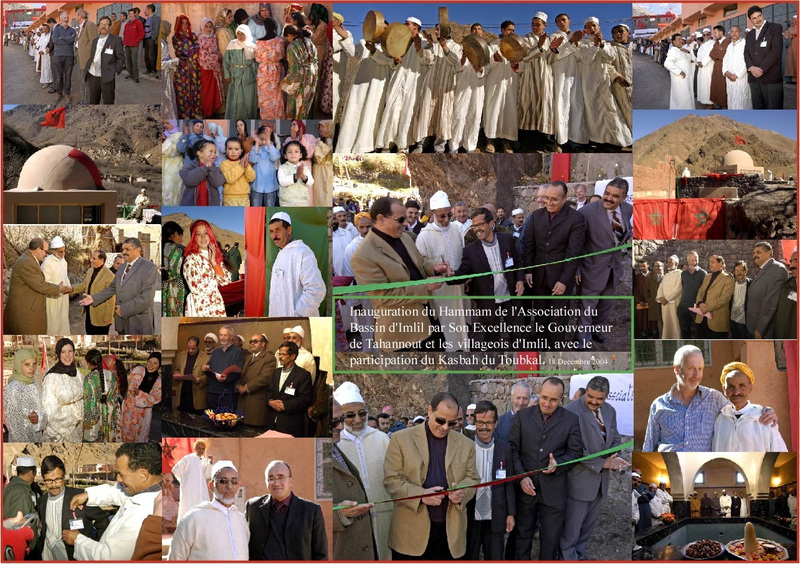 Discover encourages all visitors to the Kasbah to put forward ideas about its future development and about how we can contribute to the life of the people of Imlil. I didn’t have to jettison my preconceptions altogether however. At Kasbah du Toubkal, the restored former home of a feudal chieftain in the High Atlas, a five percent surcharge on my bill went to fund community projects for local Berber villages. Proceeds thus far have paid for two ambulances and a hammam for ritual bathing. A new school for girls is in the works. At this spectacularly situated hotel, where I watched a waterfall from my balcony, management limits waste by asking guests to drink its spring water, shun bottled water, and carry out their own empties. For fun I hiked with a guide to a Berber village where new homes are going up, thanks to a brisk, tourism-driven local economy. By appealing to a Western sense of what is socially responsible, this place attracts conscientious types such as Aaron and Paige Perrine of Seattle, who designed their honeymoon around it…“It gets to be very tiring to have to think about every decision” says Aaron “It’s nice that everything you do (at Kasbah du Toubkal) can be beneficial to the place and the people. It allows your Western conscience to relax”.